A stay at Hotel Ciutat Vella places you in the heart of Barcelona, within a 10-minute walk of Placa de Catalunya and Las Ramblas. Featured amenities include complimentary wired Internet access, complimentary newspapers in the lobby, and dry cleaning/laundry services. 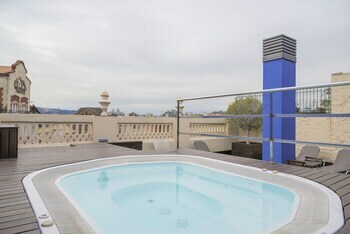 Sweet Inn Apartments Poble Nou/Beach offers accommodations throughout the area in Barcelona. Featured amenities include dry cleaning/laundry services, luggage storage, and laundry facilities. Located in Madrid (Centro), Hostal Numancia is within a 10-minute walk of Plaza Mayor and El Rastro. Featured amenities include express check-in, express check-out, and a 24-hour front desk. Located in Yaiza, Villa Rufatri is a 4-minute drive from Pechiguera Lighthouse and 5 minutes from Aqualava Waterpark. When you stay at Hotel La Terraza in Cabrales, you'll be 13 minutes by car from Cueva el Cares. The front desk is staffed during limited hours. Free self parking is available onsite. Located in Nerja, Villa Pergola Luxury B&B is within a 5-minute drive of Burriana Beach and Aqueduct of El Aguila.